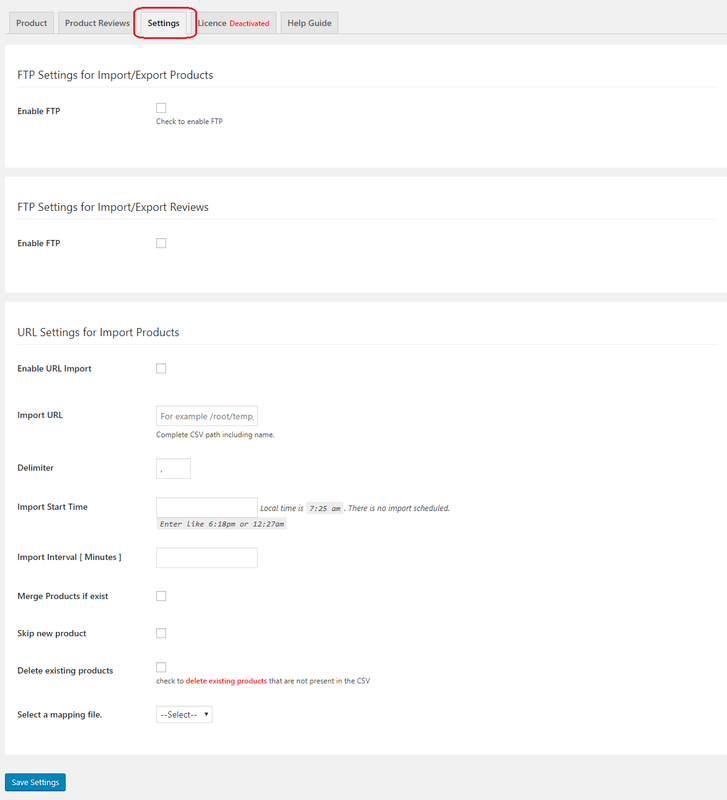 This article explains the setting up of WebToffee Product Import Export Plugin For WooCommerce. To know more about the features of the plugin, refer to the Product page. Product Import Export Plugin For WooCommerce allows you to import and export products to/from your WooCommerce store in CSV or XML format. You can use this plugin to import simple, grouped, external, variable including custom product types such as subscription, bundle or bookable products. You can easily import, export or update hundreds, even thousands of products using one file which saves your effort and time for manually adding product information. For importing products to your online store, you will need a CSV (Comma-Separated Values)/XML (Extensible Markup Language) file, which contains information about mapping fields. The plugin also facilitates you to export or import product reviews and ratings of the products by using a CSV file. You can also customize product reviews and ratings according to the needs. This option is mainly used by store owners/admin to move review and rating from one store to another. It also supports Cron Jobs (WordPress scheduled task) to schedule importing and exporting of products, as well as reviews into an FTP location in a specific time interval automatically. The CSV Import file must be in UTF-8 format. For more information about UTF-8 encoding, read How to save CSV / Excel File as UTF-8 Encoded? After purchasing the Product Export Import Plugin For WooCommerce, the plugin will be available as a zip file in the API Downloads section of your MY ACCOUNT page. For detailed information about installing WebToffee plugins, read How to Download, Install, Activate & Update WooCommerce Plugin. Plugins > Installed Plugins > Product/Review CSV Import Export > Product Import Export. In CSV Import, the plugin takes CSV file as input for importing products. It maps each field of the CSV file to the field of a particular WooCommerce product (that otherwise needs to be entered manually by admin). Each row represents one single product. You can create a CSV file by using a spreadsheet application such as Google Spreadsheets or Microsoft Excel. After entering all details about products in the spreadsheet, save this file with extension .csv. You can create one or you can export the product to get the format of CSV. Alternatively, download Product WooCommerce Sample CSV (column headers are same as WooCommerce field) and Product Commercial Sample CSV (column headers are user-defined). In XML Import, the plugin takes XML file as input for importing products. It maps each tag of the XML file to the field of a particular WooCommerce product (that otherwise needs to be entered manually by admin). You can create one or you can export the product to get the format of XML. Before you get down to configure settings for product import & export, you should know some information about mapping fields. For example, the post_title field gets mapped to the product name and the regular_price field gets mapped to the regular price of your product. If you want the plugin to work correctly, you must map all of the fields in the correct format. If there is any mistake in your import file, your product import may not work as expected. Note: Attribute names with pa are global attributes and the ones without pa are called local attributes. The Import section helps in importing products using the CSV/XML file. To start importing products, click the Import button. Method 1: Select a file from your computer – The first method is to select a CSV/XML file from your computer. Selecting a file from your computer: Click the Choose File button to select a CSV/XML file for importing from your computer. Method 2: Provide FTP Details – The second method is to select a CSV file from your FTP server. You need to provide your FTP information for importing products using this method. 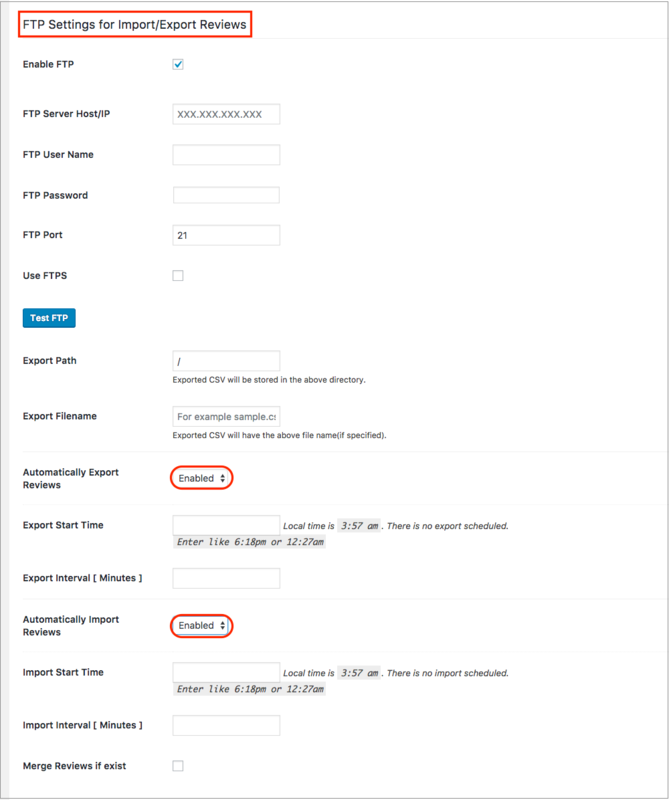 Enable FTP import/export: Check this option to enable FTP import/export. FTP Server Host/IP: Enter your FTP server hostname. FTP User Name: Enter your FTP username. FTP Server Path: Enter the FTP server path. Use FTPS: Check this option to use FTPS. FTPS (File Transfer Protocol Secure) is a secured extension of FTP (File Transfer Protocol). Method 3: Enter the URL of the file – In the third method, you can provide the URL of the CSV file from where it will be downloaded for importing the products. The section below is the Advanced Options for import. Mapping Profile: You can select an existing mapping file. Mapping files are created by mapping your imported columns to product data fields. Update products if exists: Check the Update products if exists check-box to update details of existing products on your store. The existing products are identified by their SKUs/Product IDs. Skip New Products: While updating existing products, tick this check-box to skip products which are not already present in the store. If a new SKU is encountered in the imported CSV file, it will be skipped, and only the existing products will be updated. Delimiter: In a delimited text file that is used to store data, each line represents a single entity, and has fields separated by the delimiter. A delimiter is a character used to specify the boundary between separate entities in a text file. A popular example of delimiter is the comma character, which acts as a field delimiter in a sequence of comma-separated values (CSV). Enter a delimiter to separate the mapping values. By default, a comma is taken as the delimiter. In place of a comma, you can also use other characters like /, ” “, |, @, etc. You can also use the letter ‘t‘ for parsing tab delimiter. Delete Existing Products: Check this option to delete the existing products that are not present in the importing CSV. Use SKU to link up-sells and cross-sells: Check this option to use SKU to link the up-sells and cross-sells of a product. If this option is not checked, up-sells and cross-sells of a product will be linked using the Product ID. 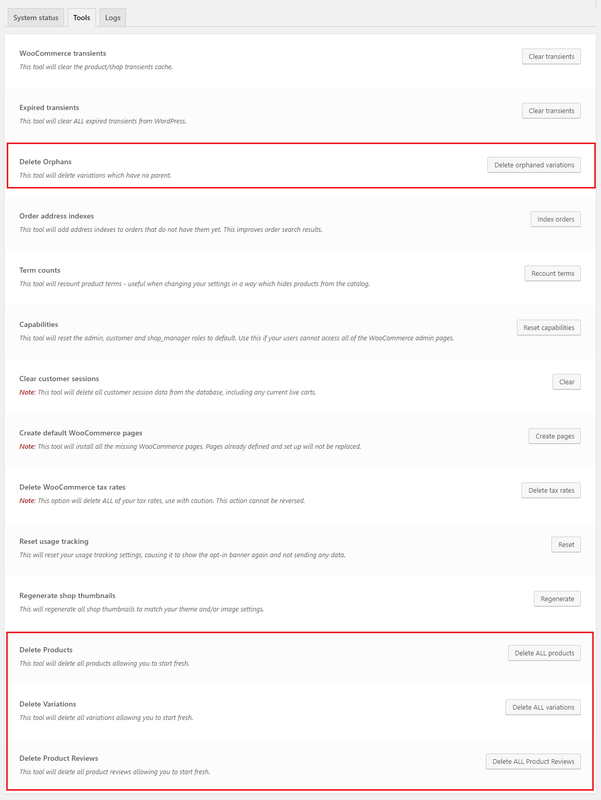 Disable thumbnail generation: Check this option to avoid the regeneration of thumbnails on import. 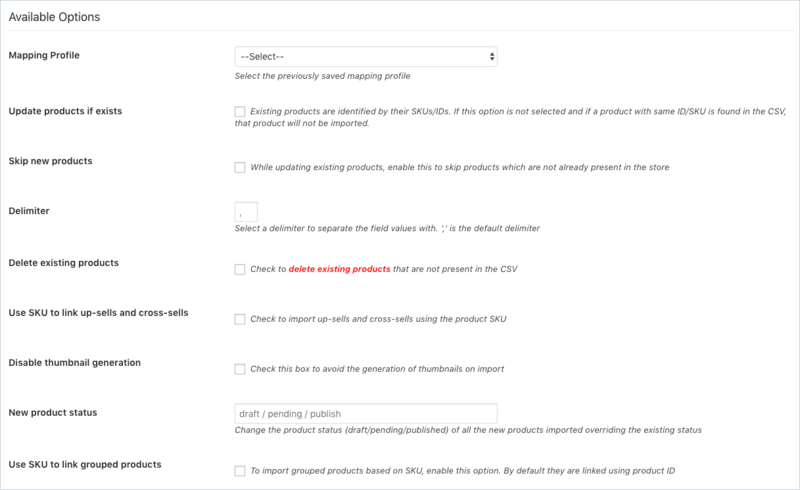 New product status: This section allows you to change the status of all the new products imported to draft, pending, or published, overriding the existing status in the CSV. 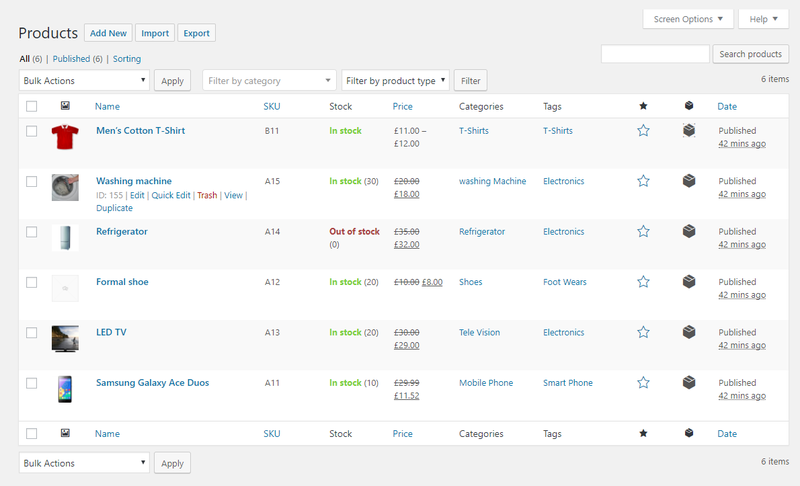 Use SKU to link grouped products: Check this option to link the grouped items using SKU. If this option is not checked, the grouped products will be linked using product IDs. Finally, click the Upload File and Import button to proceed further towards Map Fields. Map to: Represents WooCommerce product field names to which attributes will be mapped. Column Header: Represents CSV headers which will be mapped to appropriate WooCommerce fields. Evaluation Field: This column is used to fix/update the required value for a particular field. For example, to assign the value ‘cotton mixed’ to ‘attribute:pa_fabric’, enter the value =cotton mixed under Evaluation Field in the attribute:pa_fabric row. For example, to add ‘2’ to ‘length’, write +2 under Evaluation Field in the Dimension: length row. For example, to reduce ‘1’ from ‘width’, write -1 under Evaluation Field in the Dimension: width row. For example, to multiply ‘weight’ by ‘1.15’, enter the value *1.15 under Evaluation Field in the Dimension: Weight row. For example, to divide ‘sale price’ by ‘2’, write /2 under Evaluation Field in the Price: Sale Price row. For example, to append ‘Product Title’ by ‘By HikeForce’, write &By HikeForce under Evaluation Field in the Product Title row. For example, to prepend ‘Product Description’ by ‘Description’, write &Description[VAL] under Evaluation Field in Product Description row. After mapping all the required fields, save these mapping and evaluation fields in a file by specifying the filename in the Mapping file name field. Click Submit to start importing. If your existing product is modified, you can update that modification on your store by merging it with the existing product. For this, update the existing product by importing modified product CSV file. Check the Update Products if exists option from the Available Options setting of Product Import. Click Import Products to proceed further by selecting the mapping file. The process of selecting a CSV file for merging products is similar to that of importing products, as described earlier in this article. Note: If the product SKU does not already exist in your store, then the product is imported as a new product. You can import simple, grouped, variable and external products. Along with these basic product types, the plugin supports WC Composite products, WC Bundle Product, WC Booking and WC Photography. For more information on import and export of bundle products, please refer to WooCommerce Import and Export of Bundle Product. With this plugin, products can be exported into a CSV/XML file. The exported file will contain all the product information from your WooCommerce store. You can use this plugin to export simple, grouped, external and variable products, including custom product types such as subscription, bundle or bookable products. 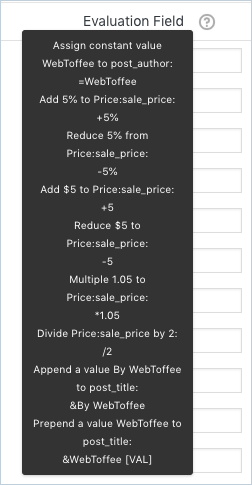 Offset: Allows you to set an offset value that lets you skip a specific number of products before exporting. Limit: Allows you to specify the number of products to be exported. For example, if Offset=0 and Limit=50, the first 50 products will be exported. If Offset=10 and Limit=50, the first 10 products will be skipped, and the remaining 50 products will be exported (from product number 11 to 60). Product Categories: Allows you to select categories of products to be exported. This option can be used as a filter for exporting products of certain categories. Product types: Allows you to select the types of products to be exported. You can import simple, variable, grouped or external products only or any combinations of these types. Note: post_parent and ID columns are entered by default. However, if you want to sort the products first by Product ID, you can manually enter ID in the Sort Columns field. Delimiter: Enter a delimiter to separate the mapping values. By default, a comma is taken as the delimiter. You can also use characters like /, ” “, |, @ and so on. Select a mapping file for export: Similar to import settings, you can select an existing mapping file for exporting products. This option is enabled only when you create your first mapping file. Columns: Select checkboxes from the Column field for the required columns to be exported. With the Column Name field, you can modify the column header in the CSV file. To do this, simply enter an appropriate name for the specified column. Include hidden metadata: Select the checkbox if you want to show hidden metadata of your products in the CSV file. To get thumbnail IDs of the product images, select this checkbox. Export Children SKU of Grouped Products: Enable this checkbox to link parent and child products with SKU. If this box is unchecked, parent and child products are linked using the product ID. Convert shortcodes to HTML: Enable this option to convert shortcode to HTML in the exported CSV. Export images as Zip file: When this option is chosen, the exported CSV will include only the names of the images of the products instead of the entire path/URL. To link the products with their corresponding images, all the images that are related to the products being imported will be downloaded to a zip file. The Export Images as Zip file option is set to no by default. So if you do not want to export the images in a separate file, you leave the field as it is and go ahead with the export. When you choose yes, click on the Export Product’s Images button to download the images in the zip file. After downloading the zip file you can export the products into a CSV/XML file. Click Export Products(CSV)/Export Products(XML) to start exporting products to CSV/XML file respectively. The exported CSV will be downloaded on your computer automatically. The following is a screenshot of a sample exported CSV file. To export product details, select the products you want to export and select Download Products as CSV from the Bulk Actions drop-down list and click Apply. 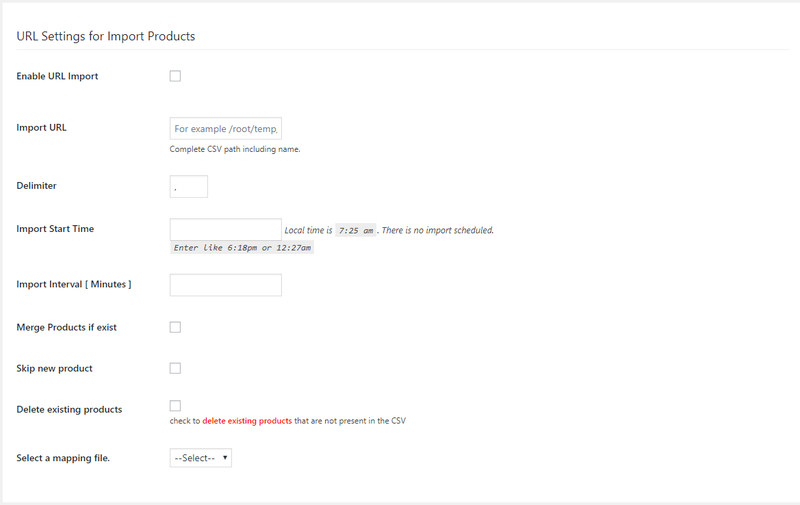 All the details about selected products will be auto-downloaded to the CSV file. The Product Reviews Import/ Export tab allows you to export or import product reviews and ratings of the products by using a CSV file. You can also customize product reviews and ratings according to your needs. This option is mainly used by store owners/admin to move reviews and ratings from one store to another. For importing product reviews to your online store, you must create a CSV (Comma-Separated Values) file, which contains information about mapping fields in the tabular form. You can create the CSV file by using a spreadsheet application such as Google Spreadsheets or Microsoft Excel. Save this file with extension .csv. After entering all the details about products in the spreadsheet, you can import product reviews to your online store. It also supports Cron Job (WordPress scheduled task) to schedule importing and exporting of products reviews into an FTP location in a specific time interval automatically. To configure product reviews import and export, read this article on How to import and export product reviews using WooCommerce Product Reviews Import Export Plugin?. The Settings tab helps in auto-exporting and/or auto-importing products, as well as reviews through FTP. You need to provide your FTP information, time period, and mapping file information among other settings. 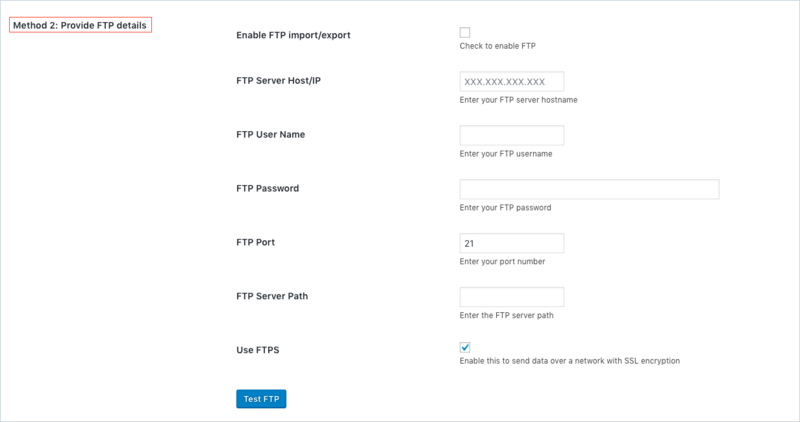 FTP Settings for Import/Export Products: These settings are used to configure FTP settings for importing and exporting products automatically (also known as Cron job). Enable this option to display further settings. 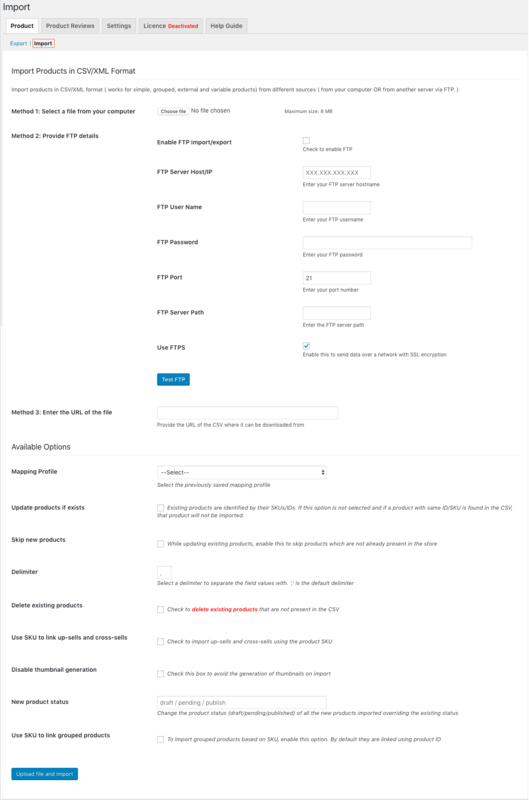 Enable FTP – Check this option to enable FTP settings for product import/export. FTP Server Host/IP – Enter your FTP Server hostname. FTP User Name – Enter your FTP username. FTP Password – Enter your FTP password. FTP Port – Enter your FTP port number. Use FTPS – Check this option to use FTPS. FTPS (File Transfer Protocol Secure) is a secured extension of FTP (File Transfer Protocol). Test FTP – Click on this to check whether your FTP connection is working fine or not. Export Path – Here you can specify the path where the exported file will be saved on the server. Export Filename – This section allows you to enter the name the exported file will be saved with. Automatically Export Products – Enable this option to configure the automatic export of products. Convert Shortcodes to HTML – Enable this check-box to convert shortcodes to HTML in the CSV. Product Categories – This field allows you to enter the categories of the products only which will be exported. Export Start Time – Enter the start time for export. You can enter a time value like 10:10am. Export Interval [Minutes] – Enter the time interval in minutes for exporting the products. Include hidden metadata – Check this box to include hidden metadata in the CSV file. Select an export mapping file – Allows you to select a required export mapping file from the given drop-down list. This field is only available if you have already saved an export mapping file in a prior export. Automatically Import Products – Enable this option to configure the automatic import of products. Import File – Enter the complete path on the server of the CSV file to be imported. Delimiter – In this field, enter the type of the delimiter that the importing CSV file is using. Import Start Time – Enter the start time for import. You can enter a time value like 10:10am. Import Interval [Minutes] – Enter the time interval in minutes for importing the products. Merge Products if exist – Check this option to merge existing products with updated information of the product in the import file. The merging of the product is possible only if the product ID or SKU already exists in your online store. Otherwise, the product is imported as a new product. Skip new product: If a new product SKU is encountered in the imported CSV file, it will be skipped, and only the existing products will be updated. 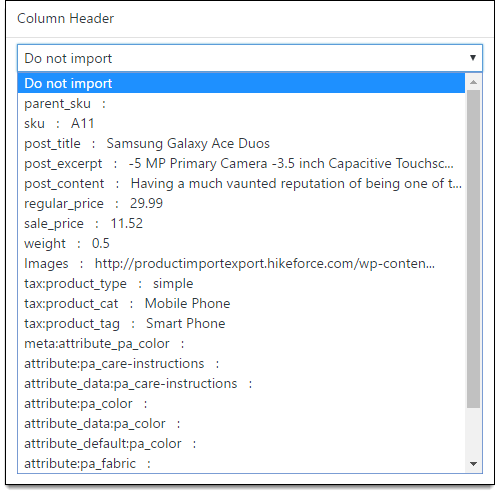 Delete existing products: Checking this option will delete the products from the store that are not present in the importing CSV file. Use SKU to link up-sells and cross-sells: Check this option to link up-sells and cross-sells using the SKU of the product. New product status: You can change the status of all the products being imported to the status specified in this field (draft/pending/published). Use SKU to link grouped products: Checking this option will link all the grouped products using the product SKU instead of the product ID. Select a mapping file – Allows you to select a required import mapping file from the given drop-down list. 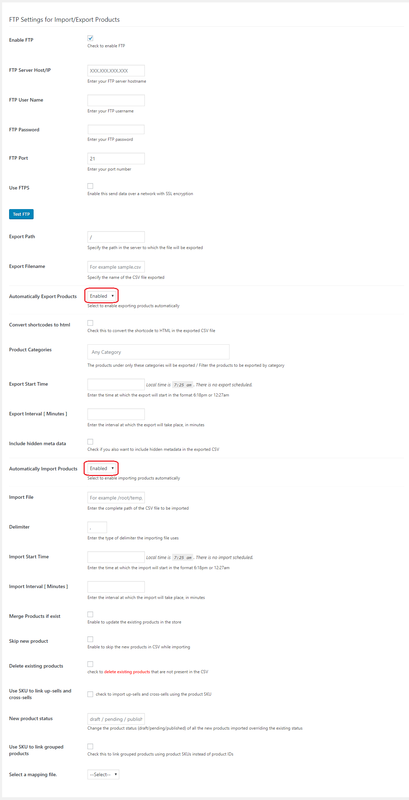 FTP Settings for Import/Export Reviews: These settings are used to configure FTP settings for importing and exporting reviews automatically (also known as Cron job). Enable this option to reveal further settings. Test FTP – Click to check whether your FTP connection is working fine or not. Export Path – Here you can specify the path where the exported CSV file will be saved. Export Filename – This field allows you to specify the name of the exported CSV file. Automatically Export Reviews – Enable this option to configure automatic export of reviews. Export Interval [Minutes] – Enter the time interval in minutes for exporting the reviews. Automatically Import Reviews – Enable this option to configure automatic import of reviews. Import Interval [Minutes] – Enter the time interval in minutes for importing the reviews. Merge Reviews if exist – Check this option to merge the existing review with an updated review of the same product. URL Settings for Import Products – This option allows you to automatically import products (also known as Cron job) from the specified URL. Enable URL Import – Check this option to enable settings for importing products using URL. Import URL – Enter the URL path of the CSV file to be imported. Delimiter – Enter the delimiter the CSV file to be imported is using. Merge Products if exists – Check this option to merge existing products with updated information of the product in the import file. The merging of the product is possible only if the product ID or SKU already exists in your online store. Otherwise, the product is imported as a new product. Skip New Product – If a new product SKU is encountered in the imported CSV file, it will be skipped, and only the existing products will be updated. Delete existing products – Check this option to delete the products from the store that does not exist in the CSV. Finally, click Save Settings to save the settings. For more information on Cron Job, read Setting Up Cron Job for WooCommerce Product Import and Export. Go to Dashboard > WooCommerce > Status > Tools section. In this section, there are four options that are provided by our WooCommerce Product Import Export plugin. They are used for deletion of all products and reviews, allowing you to start all over again. Delete Orphans: To delete variations which have no parent. Delete Products: To delete all products of your store, allowing you to start afresh. Delete Variations: To delete all product variations. Delete Product Reviews: To delete all product reviews. Check out the features of Product Import Export Plugin For WooCommerce here. For more understanding of the plugin, check out the product documentation section.